This recipe is one of those that feels so special you want to save it for an occasion, but really, it's great anytime. The original recipe wasn't gluten-free, but has so little flour in it that it was an easy gluten-free makeover. One of the things I really like here is that you start the cake in a cast-iron skillet, and then just transfer to the oven for final baking. Preheat over to 350-degrees (F). Melt 2 T. butter in a 10" cast-iron skillet using pastry brush to coat sides. Sprinkle with 1/4 c. sugar and cook until bubbly and golden brown. 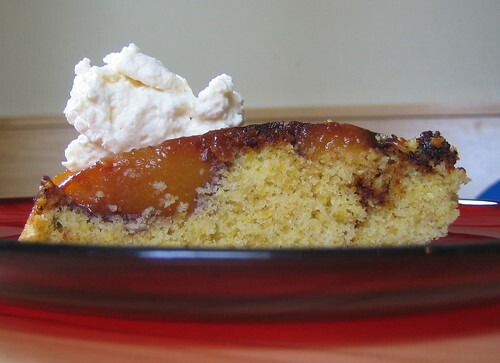 Arrange peaches as shown on top of sugar. 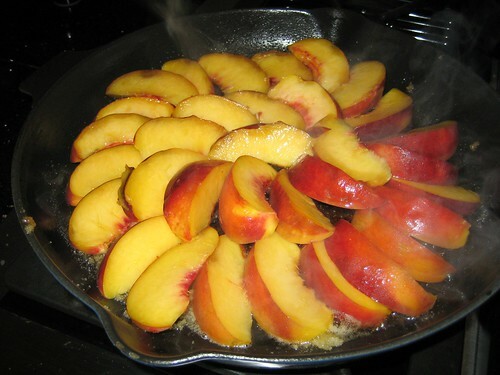 Reduce heat to low and cook 10 minutes or so until peaches soften. Remove from heat. Beat remaining butter and sugar with mixer on high until fluffy. Add eggs one at a time. Mix in vanilla and cream. Whisk remaining dry ingredients together and then add to butter mixture. Drop large spoonfuls of batter over peaces and spread. Bake until golden brown and a tester comes out clean (about 20-25 minutes). Let stand 10 minutes and then run a knife around the edge of cake. Quickly invert cake onto a cutting board. Let cool before serving. I like it with fresh whipped cream with just a touch of vanilla and sugar added. Oh, this looks divine. Can't wait to try it! Thanks! In the oven as I type. Curious and excited. Inspired: Let me know what you think. We loved it! P.S. Where are you that you can get good, fresh peaches this time of year?! But in a word....OMGoodness, that was divine! Seriously scrumptious. This is from a woman who just doesn't get overly excited about stuff. Easy to make, pure joy to have for dessert with a cup of amazing Java. I'm just now going to post to my niece on FB. And re the peaches....sorry, I cheated and I am ok with it...used canned. But it was still scrumptious. I had a peach tree a few years ago, but it died. We managed to get 6 good summers from it. So yes, fresh peaches would totally kick it up a notch.